Thanks to all for reading (or at least paging through) my 30 articles in 30 days during National Blog Posting Month. It did include (*cough*) a half-dozen posts on Monday and Tuesday, not the first time I've busted out plenty of material at a project's end. This being about baseball cards, let's look at some stats! Not gonna lie, I thought this month would include more non-profile articles! Hat tip to writer and fellow Dodger fan Night Owl, who inspired the cross-blog Oldest Card in My Collection and Top 5 Number Fives posts. Here's some article context breakdown. Most-read article: "Oldest Card in My Collection"
What's next? Fortunately for me, more #5s. 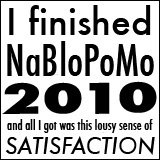 Had no idea it was NaBloPoMo month. Didn't even know it existed. I think I missed a day in there. I'll have to do better next year.